1. Card Table – Truth be told, I put it there. A family in the church borrowed it, and after worship yesterday, they returned it. They gave it to me in the parking lot, and I decided to leave it for today to put away. Did you ever think about how many churches have a lot of possessions? We own land, a building, and a lot of stuff that we store inside the building. Much of what we own is for the purposes of worship on Sunday morning, education, and fellowship. That means we have a lot of tables and chairs, and we make some of them available for the family of Faith Church to use as they need. We’ve also allowed local businesses and service organizations to use our facility and property many times. I love the generous spirit which permeates our congregation. This also gets me thinking about how easy it is to confuse the property with the people. The church is not property, it is the people. The property is neutral, neither good or bad. How the people view the property and use it is another story. The church property, building, equipment, kitchen, supplies, etc. are all wonderful tools that can serve God’s mission of the church. But it is the people that are the church! 2. 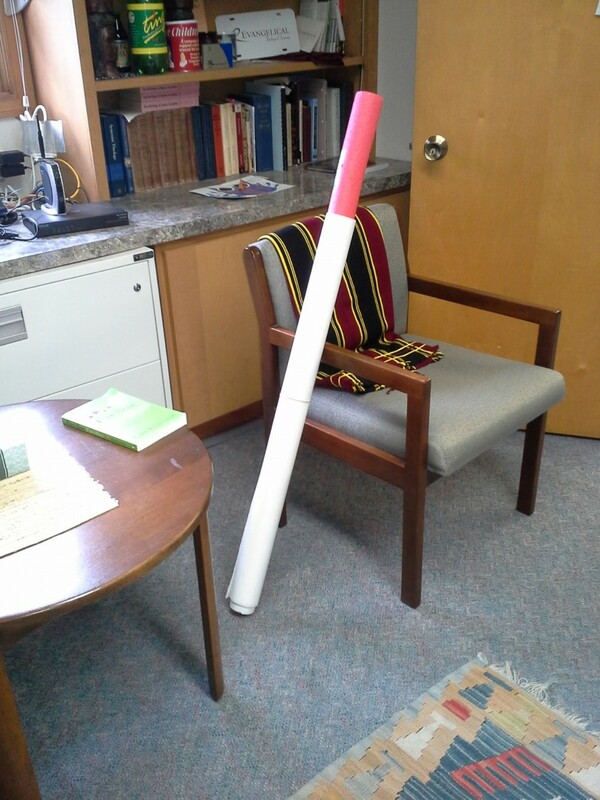 Pool Noodle wrapped in paper – On a normal week it would be exceedingly odd to find a pool noodle wrapped in paper in my office. Then again, granted some of the things that have mysteriously shown up here over the years, I suppose it wouldn’t be all that odd. In this case, it isn’t a normal week, and I know why the pool noodle is here. The reason is Advent! For Advent this year we have four artists who each created a piece to illustrate the Scripture passage for one of the weeks of Advent. Each creation is 70inches by 30 inches! Same as a standard door. Not the easiest size to bring to church! This coming week’s artist(s) wrapped their art around the pool noodle, thus making it easier to transport. I’ve been so thankful for the artists in the family of Faith Church, how they have used their gifts to worship the Lord. Since we started the Gospel of Luke, the four stories are the Angel Gabriel’s announcement of the birth of John the Baptist to Zechariah, Gabriel’s announcement of the birth of Jesus to Mary, the birth of John the Baptist, and finally the birth of Jesus. Join us on Sunday at Faith Church to see the reveal of the final art panel as well as who the artist was! Till then, it’s a surprise! 3. Plate of cookies – Last Thursday, our ladies had a Christmas cookie/recipe exchange and they thoughtfully left a plate aside for those of us who were here on Friday morning for sermon roundtable. The leftovers were still on my office counter this morning. I think we’ve had Christmas cookies three times for special events recently. At our church Christmas decorating party, after caroling last evening, and the cookie exchange. They were delicious! Thanks ladies.